This article is for SAP HANA beginners, who don’t really understand what it is about and are lost in all the marketing and technical jargon. SAP HANA is the latest in-memory analytics product from SAP; using HANA companies can do ad hoc analysis of large volumes of data in real-time. In-memory means all the data is stored in the memory (RAM). This is no time wasted in loading the data from hard-disk to RAM or while processing keeping some data in RAM and temporary some data on disk. Everything is in-memory all the time, which gives the CPUs quick access to data for processing. Using HANA, companies can analyze their data as soon as it is available. In older days, professionals had to wait at least few hours before they could analyze the data being generated around the company. To put this in perspective, let us take an example – suppose a super market chain wants to start giving you discount coupons when you visit them based on your shopping habits. Before: they could only mail them to your address or give you coupons for your next purchase. Now: while you are checking out, your entire shopping history can be processed and discount could be given on the current shopping. Imagine the customer loyalty for such a chain! So is SAP making/selling the software or the hardware? SAP has partnered with leading hardware vendors (HP, Fujitsu, IBM, Dell etc) to sell SAP certified hardware for HANA. SAP is selling licenses and related services for the SAP HANA product which includes the SAP HANA database, SAP HANA Studio and other software to load data in the database. Also, as already announced, the vision is to run all the application layer enterprise software on the HANA platform; that is ERP/BW/CRM/SCM etc /etc will use HANA as their database. Can I just increase the memory of my traditional Oracle database to 2TB and get similar performance? Well, NO. You might have performance gains due to more memory available for your current Oracle/Microsoft/Teradata database but HANA is not just a database with bigger RAM. It is a combination of a lot of hardware and software technologies. The way data is stored and processed by the In-Memory Computing Engine (IMCE) is the true differentiator. Having that data available in RAM is just the icing on the cake. Is HANA really fast? How is it possible that HANA is so fast? HANA is fast due to many reasons. 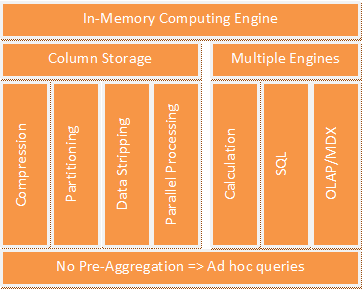 The following picture1 depicts a very simplified version of what’s inside the In-memory Computing Engine. 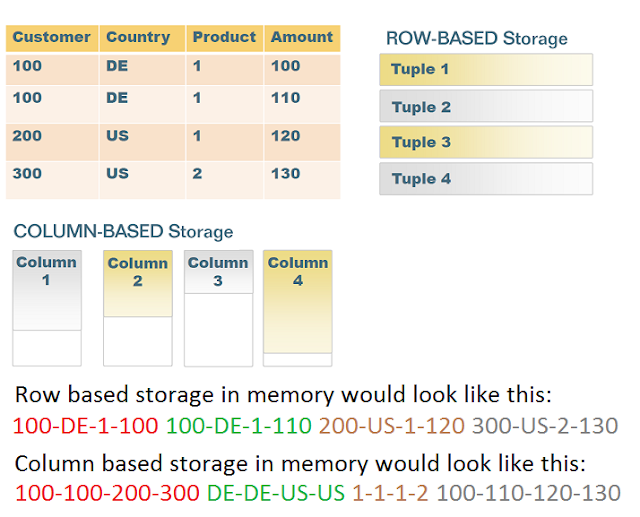 While the traditional databases store the relational table one row after another, IMCE stores tables in columns. Hopefully the following figure explains the difference between the two storage mechanisms easily. Example of dictionary algorithm: You have a Country column in your Customer table in your database. Let’s say you have 10 million customers from 100 countries. In the standard row-based storage you will need 10 million string values stored in memory. With the dictionary compression, the 100 country values will be assigned an integer based index and now you need only 10 million integers + the 100 string values + the mapping of these values. This is a lot of compression in terms of bytes stored in memory. There are more advanced compression algorithms (RTE etc) which would even reduce the 10 million integer storage. Now imagine a scenario with 100 tables and a few thousand columns. You get the picture. Less data is exponentially proportional to fast processing. The official tests show a compression of 5-10x, that is a table which used to take 10GB of space would now need only 1-2GB of storage space. Partitioning: SAP HANA supports two types of partitioning. A single column can be partitioned to many HANA servers and different columns of a table can be partitioned in different HANA servers. Columnar storage easily enables this partitioning. Data stripping: There are often times when querying a table, a lot of columns are not used. For example, when you just want the revenue information from a Sales table which stores a lot of other information as well. The columnar storage enables that the unnecessary data is not read or processed. As the tables are stored in vertical fashion, there is no time wasted trying to read only the relevant information from a lot of unnecessary data. Parallel Processing: It is always performance critical to make full use of the resources available. With the current boost in the number of CPUs, the more work they can do in parallel, the better the performance. The columnar storage enables parallel processing as different CPUs can take one column each and do the required operations (aggregations etc) in parallel. Or multiple CPUs can take a partitioned column and work in parallel for faster output. SAP HANA has multiple engine inside its computing engine for better performance. As SAP HANA supports both SQL and OLAP reporting tools, there are separate SQL and OLAP engines to perform operations respectively. There is a separate calculation engine to do the calculations. There is a planning used for financial and sales reporting.Above all sits something like a controller which breaks the incoming request into multiple pieces and sends sub queries to these engines which are best at what they do. There are separate row and column engines to process the operations between tables stored in rows and tables stored in column format. Caution: Currently, you can't perform a join between a table stored in row format and a table stored in column format. Also, the query/reporting designer needs to be careful about which engines are being used by the query. As the performance reduces if for example the SQL engine has to do the job of the calculation engine because the controller was not able to optimize the query perfectly. In traditional data warehouses, such as SAP BW, a lot of pre-aggregation is done for quick results. That is the administrator (IT department) decides which information might be needed for analysis and prepares the result for the end users. This results in fast performance but the end user does not have flexibility. The performance reduces dramatically if the user wants to do analysis on some data that is not already pre-aggregated. With SAP HANA and its speedy engine, no pre-aggregation is required. The user can perform any kind of operations in their reports and does not have to wait hours to get the data ready for analysis. I hope the above information is useful to get a better understanding of SAP HANA.Please let me know your comments/suggestions. 1: The picture is obviously a much simplified version of the engine and there is much more to it than represented in the picture. Disclaimer: I am an SAP employee and a certified HANA consultant. All the opinions expressed here are completely my own and have no influence of my employer. Very Helpful. A little more of Columnar storage explanation is anticipated. Still this is a very good article. For the SAP HANA certification, I see 8% of questions from "Business Content". But TZHANA course doesn't have any content for Business Content and "Optimization". Is this available in any other help document? Pl advise. I have heard that loading the IMDB from DISK to RAM takes lot of time. Where can I find more data on this loading times please? Excellent blog, really very informative and the fact that the definition are very precise makes it understanding lot easier. Appreciate and looking forward to future blogs..
very well simplified explanations. Appreciate your effort. It's a good thing that this software can store a lot of important documents for a company. However, if there are thousands of files and documents stored, would there be any chance that the software may be crippled because of the amount of stored information? On the other hand, I do like how the multiple engines inside the software improve its performance. But don't know how to proceed for this. I have a basic knowledge of the SAP Basis Administration and having 1 yr. experince in it, but i want bulid up more in SAP technology. Good one...clear explanation .Thank u.
I am SAP Project System Functional Consultant. Let me know if doing SAP Hana Application Consultant will be useful and advantage for me in current and i future sap market. transactions to complete the Order to Cash process. It includes the following information and processes.SAP SD TRAINING IN A SIMPLE WAY. i am currently ETL tester and workeed on BI Testing prior, currently planning to take up SAP HANA as carrer, can a person without having SAP background will fit into SAP HANA? Could you please suggest if this is right move? It is very useful who is looking for sap hana Online Training. Thanks for providing the best information it's very useful for SAP HANA learners we also provide the best SAP HANA Online Training . Nice article I was really impressed by seeing this article, it was very interesting and it is very useful for SAP HANA online training Learners.I came to know that 123trainings is also one of the best SAP HANA online training institute at hyderabad. It was nice article it was very useful for me as well as useful foronline Sap Hana training learners. thanks for providing this valuable information. It was nice article it was very useful for me as well as useful forSap Hana learners. thanks for providing this valuable information. Well thanks for sharing such a nice knowledge keep it updates see sap jobs and get the best career opportunaties. Nice and Simple overview on Hana. I think it is very useful to us. Because now a days Software Testing is very important. Thanks for sharing this article, Your post is really very helpful. Guys if you are looking forward for your career in SAP then you can join Shivansh solution now. It provides proficient SAP training and consultation services and makes their apprentices to stand out in the market. Thanks for sharing this informative blog..If anyone wants to get SAP ABAP Training in Chennai, please visit FITA Academy located at Chennai, rated as No.1 SAP Training Institutes in Chennai. Really awesome blog. Thanks for sharing this informative blog. Suppose if anyone want to learn Software Testing Training in Chennai at a reputed training institutes. If you are looking for best Software Testing Training Institutes in Chennai reach FITA located at Chennai, India. Rated as No.1 placement and training center in Chennai. Hi, I have read your blog. Your information is really useful for me.Thanks for sharing this blog. I did QTP Training Chennai at Fita training and placement academy which offer best Selenium Training Chennai with years of experienced professionals. This is really useful for me to make a bright career. I get a lot of great information from this blog. Recently I did oracle certification course at a leading academy. If anyone interested to learn best Oracle Training in Chennai visit FITA academy which offer SQL Training in Chennai. Thanks for sharing this niche useful informative post of SAP HCM & ABAP tips to our knowledge, Actually SAP is ERP software that can be used in many companies for their day to day business activities it has great scope in future if anyone wants to take sap training in Chennai get here. I feel satisfied to read your blog, you have been delivering a useful & unique information to our vision even you have explained the concept as deep clean without having any uncertainty, keep blogging. It's very good blog which seems very helpful information. Thanks for sharing this post. Keep further posting...!! Oracle Training in chennai I am reading your post from the beginning, it was so interesting to read & I feel thanks to you for posting such a good blog, keep updates regularly..
Oracle Training in chennai Wonderful blog.. Thanks for sharing informative blog.. its very useful to me.. There are lots of information about latest technology and how to get trained in them, like Hadoop Training in Chennai have spread around the web, but this is a unique one according to me. The strategy you have updated here will make me to get trained in future technologies Hadoop Training in Chennai By the way you are running a great blog. Thanks for sharing this. Thanks for sharing this informative blog. I did SAS Certification in Greens Technology at Adyar. This is really useful for me to make a bright career..
Hello Admin, thank you for enlightening us with your knowledge sharing. PHP has become an inevitable part of web development, and with proper PHP course in Chennai, one can have a strong career in the web development field. We from Fita provide PHP course in Chennai with the best facilitation. Any aspiring students can join us for the best PHP course in Chennai. Very good articles,thanks for sharing. Nice site.... refer this site .if Our vision succes!Training are focused on perfect improvement of technical skills for Freshers and working professional. Our Training classes are sure to help the trainee with Realtime methodologies. Movers And Packers Delhi singularly guarantee you to take everywhere on your weight and abandon you bother free for a new begin. Our style to take every necessary step is one of a kind and straightforward, which is our fundamental component of notoriety. Presently our inquiry emerges of different styles in all things and now you may want to consider of what is that style after all? Yes, we will answer you that in taking after content yet before we might make you mindful about the administrations we give that are more fundamental. Packers Movers Kolkata are please to help people in the most meaningful manner we did whatever makes us feel comfortable. We love to help people in the best manner as we can do. By giving you our services we feel like we are on the top of this world. You just have to keep faith in us and we will be their anytime you wanted. Join hands with us and forget all your worries regarding shifting and packing and moving from one place to another. For latest and updated SAP certification dumps in PDF format contact us at completeexamcollection@gmail.com. A good informative post that you have shared and appreciate your work for sharing the information..
. MOVERS AND PACKERS BANGALORE act as sign given by you and in this way every movement from our side is dedicated to you. With the unobtrusive components of the most noteworthy associations of the city recorded with us, you can either reach them direct and interest for the free relocation refers to from them or you can approach the enquiry structure joined with us and get refers to from the recorded packers and movers particularly on your inbox or over your phone. Thank you for sharing good information.. The post given by you is useful and helpful for the internet learners. We IT Hub Online Training best in giving SAP HANA Online Training service for more content u can visit our site.....!! Begin to learn some innovative things to develop my career skill set, your blog having vital information for me, keep sharing your information regularly for my future reference. based company provided that Movers And Packers Jaipur Services for Office, Home, Local or domestic and commercial purposes. Movers and Packers Pune colleagues put all their experience for the whole technique and include every one of their aptitudes till the whole procedure of #pressing, #stacking, #emptying and setting the obliged stuff to the spot the client #needs. So the whole process is finished with enough care as we probably am aware how significant and how sincerely our customers are appended with their articles and products. We esteem your feeling and your well deserved cash. Thanks for the nice topic. Very useful information. Thanks for sharing useful information for us. You did a great job.. Thanks a lot for sharing this useful informtive post with us.. Keep on blogging like this informative post with us, to develop my career in the right way. thank you for sharing useful content, step by step neatly explained.. This is an awesome post.Really very informative and creative contents.Thanks to sharing these concept is a good way to enhance the knowledge.I like this site very much.I like it and help me to development very well.Thank you for this brief explanation and very nice information.Well, got a good knowledge. Thanku for giving the explanation about sap hana ..
SAS Institute introduced the SAS Certified Professional Program.